Lock in a great price for Scarlet Pearl Casino Resort – rated 9.3 by recent guests! The atmosphere was nice, however, as beautiful as the facility is there should be a smoke free area in the casinos, and even though, I had a smoke-free room, it still smelled of smoke during my stay. Also, I find it strange that this hotel have very few winners in the casino. When every aspect of our stay was exceptional, it is difficult to single out a single feature. We were both very impressed with the physical building design - lots of light, wonderful architectural features, wonderfully "comfortable" feeling. 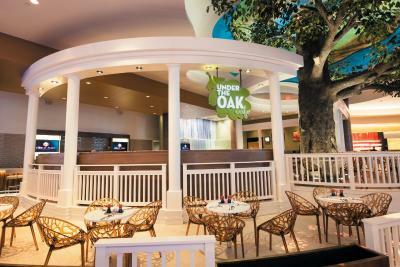 The restaurants - buffet & Oaks, in particular - were superb! the layout of the casino was perfect. the room view was GREAT. the buffet was delicious. I liked the room very much. The staff was very friendly and helpful. The food was delicious. The property is very well kept. Location was fine. I will come back and stay again. Exceptional! Staff was great! Waiter named Matthew very personable. Very clean, comfortable, and a great staff. I will be back! Luncheon buffet was bountiful, tasty, and well worth the money. The bed was very comfortable. Parking was free. We loved everything, we will request a room with a pool view next time tho. :) Beautiful place! Great staff. My 10 year old loved the pool especially. Very clean. We loved the complimentary valet service. The suite has great view with this whole window thing ya got going on. Valley is quick. Scarlet Pearl Casino Resort This rating is a reflection of how the property compares to the industry standard when it comes to price, facilities and services available. It's based on a self-evaluation by the property. Use this rating to help choose your stay! 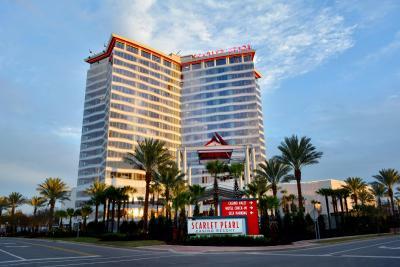 Scarlet Pearl Casino Resort features contemporary guest rooms with views of the Mississippi Gulf Coast and direct access to on-site slot machines, gaming tables and other entertainment. Free WiFi is among the convenient amenities offered. The resort is located 5 minutes' drive from Biloxi Beach. 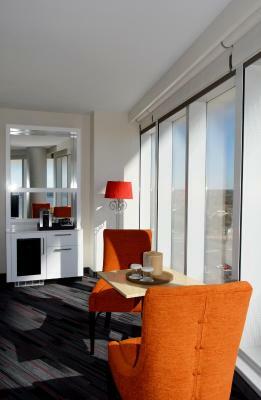 Floor-to-ceiling windows with motorized shades are provided in the rooms at Scarlet Pearl Casino Resort. 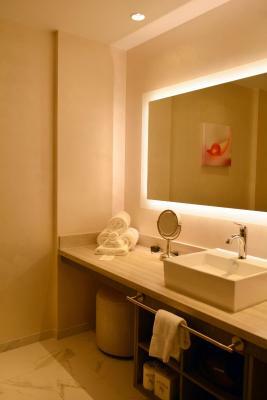 A flat-screen TV and single-serve coffee machine are also included. Guests can play golf at Lava Links, the on-site miniature golf course, which features an erupting volcano surrounded by lush gardens, waterfalls, footbridges and music. The 24-hour fitness center is equipped with treadmills, ellipticals and stationary bikes. 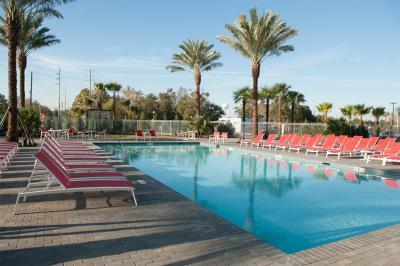 You can also relax at the Garden Oasis, which features a heated pool. Scarlet Pearl Casino Resort's on-site bar, PRL Bar, serves cocktails and offers a 144-square foot entertainment screen. 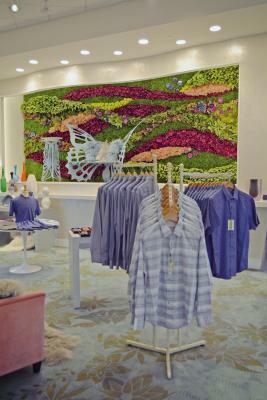 The Frankly My Dear Boutique offers an on-site shopping to guests of this casino resort. 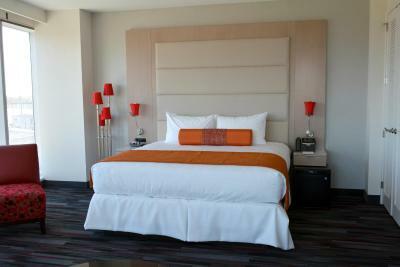 When would you like to stay at Scarlet Pearl Casino Resort? 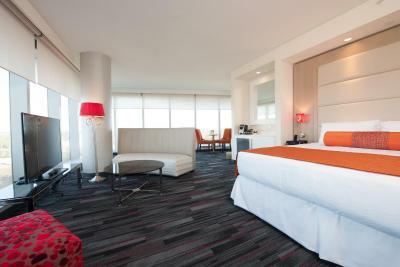 Boasting floor-to-ceiling windows with motorized shades, this room also features a 49-inch LED TV. 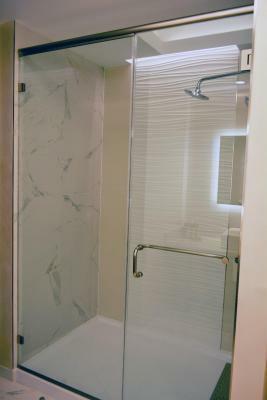 The bathroom offers a walk-in shower with shower head. A Keurig coffee machine and compact refrigerator are also provided. 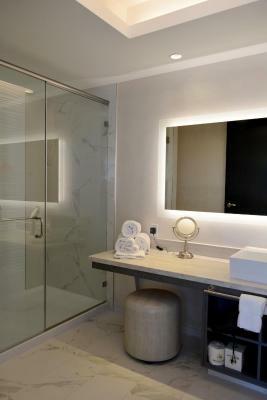 This suite features a 49-inch LED TV, floor-to-ceiling windows and motorized shades. 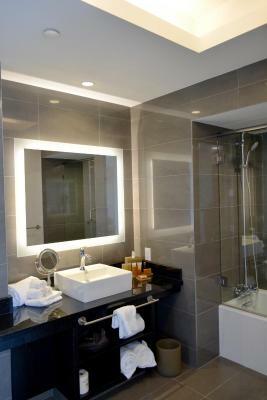 A Keurig coffee machine, refrigerator, and en suite with a walk-in shower, and separate bathtub are also included. 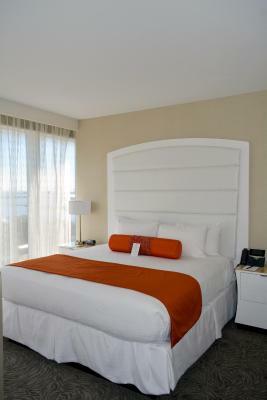 Boasting floor-to-ceiling windows with motorized shades, this room also features a 49" LED TV. 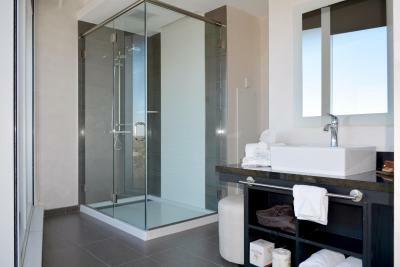 The bathroom offers a spacious walk-in shower with shower head. A Keurig coffee machine and compact refrigerator are also provided. 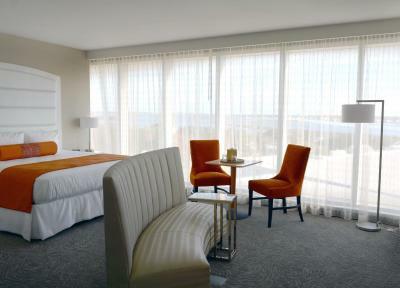 This center suite features a 55-inch LED TV and floor-to-ceiling windows with motorized shades. 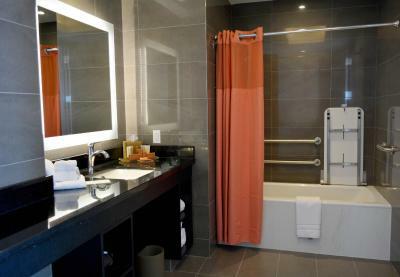 A Keurig coffee machine, compact refrigerator, and a private bathroom with a shower-bathtub combination. 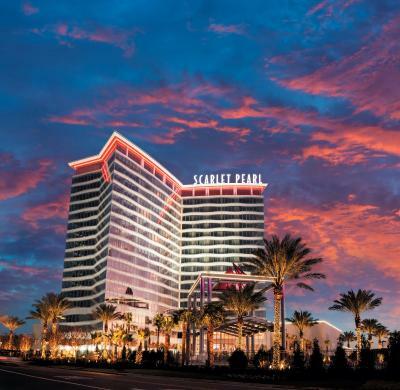 Scarlet Pearl Casino Resort is “The New Way!” Bright, friendly spaces and an atmosphere of resort modernity complemented by southern hospitality makes the Mississippi Gulf Coast’s newest and most exciting resort an immediately inviting place. 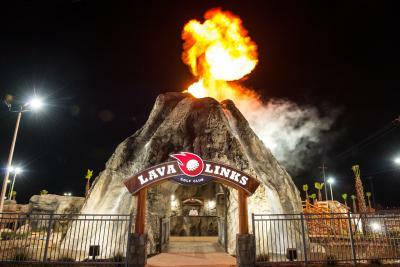 Lava Links Miniature Golf Course offers a new way to enjoy some family-friendly fun as you putt your way passed an erupting volcano, a unique course and exciting experience for all ages. Afterwards, cool off in the luxurious shade by the Garden Oasis Pool. 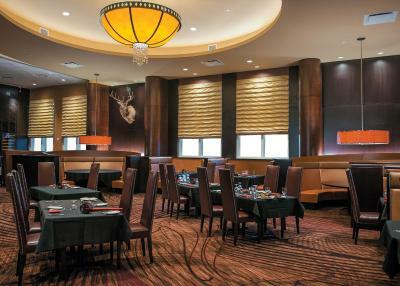 The Scarlet Pearl Casino Resort also offers the new way to dine—from rib-eye steaks prepared to perfection in the elegant atmosphere of Scarlet’s Steaks & Seafood to casual dining at Under The Oak Cafe, Chopstx Noodle Bar, or Waterfront Buffet. And don’t forget the new way to win! With over 1,200 of the best slot machines, 45-top-of-the-line table games and 100 video poker games, you are sure to find an old favorite or make a new one. 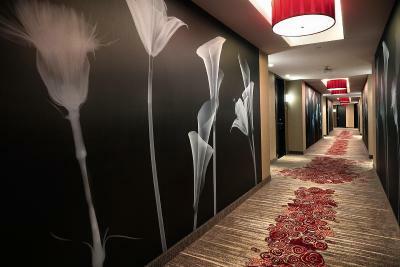 House Rules Scarlet Pearl Casino Resort takes special requests – add in the next step! Scarlet Pearl Casino Resort accepts these cards and reserves the right to temporarily hold an amount prior to arrival. Guests using a debit card in lieu of a credit card acknowledge unused funds are released upon check-out, yet may take 7 to 10 business days to become available through their financial institution. All nonrefundable reservations will be charged at the time of reservation. Please note that Scarlet Pearl Casino Resort will no longer accept pre-paid debit cards. Contact property for details. however, as beautiful as the facility is there should be a smoke free area in the casinos. Even though, I had a smoke-free room, it still smelled of smoke during my stay. Also, I find it strange that this hotel have very few winners in the casino. One improvement suggestion - having luggage carts available for self-parking guests. It would save a lot of wear 'n tear on the elevators, too. Beds were a little hard. The wait staff was slow and not attentive to the customers. there were only 3 tables with customers and everyone was waiting. nothing. it was what I expected. It was a non smoking room and it wreaked of cigarettes! All during the night when I woke up, all I could smell was cigarettes. Did not make up the room the first night. Wonderful room, great customer service, price. Casino slots were not paying out. For the size of the facility, the casino was small.